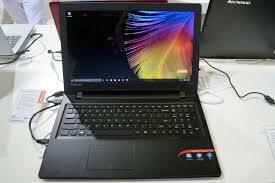 I recently received a nearly new pre-owned Lenovo 300 IdeaPad i5 2TB 8GB notebook. It was a refurbished laptop which I won on eBay (exdemolaptops if you are interested). One of the main requirements for me was a bottom hatch that allows me to quickly swap the hard disk and of course, USB ports! It has one USB 3 port and two USB 2 ports. I swapped over the 1TB spinny-thing for a 120GB SSD so that I could do Windows Installs as quickly as possible for testing the new Snappy+Choco version of E2B. A completely automated Win10Pro install, including installing 19 drivers and 2 applications takes under 15 minutes. Thankfully, CSM and UEFI-booting are easily selectable (via Fn+F12) and booting to E2B is really fast on the USB 3 port too! 1. No HDD activity LED! 2. The F1-F12 function keys (top row) only work if you press the Fn function button (bottom left). So to get the BIOS Boot selection pop-up menu, you have to press Fn+F12. To get a Windows console under WinPE, you have to press SHIFT+Fn+F10! This is really annoying to me because the whole idea of the F-keys is that you can quickly access special functions with a quick finger press - now I need TWO HANDS to access a function because of the distance between the Fn key and the F12 key for instance! A really bad design choice Lenovo! The E2B + Snappy + Choco enhancement is going well. I will eventually provide sample XML files for Win 8 and Win10 Basic+Pro, so you can install any system complete with drivers and any apps you need (you can easily modify the apps list). Well that's the idea anyway, but of course many drivers are unique to a particular notebook. However, with a bit of work, you can easily add in your own drivers and applications for specific systems. I will document how to do it at a later date. I am still ironing out a few niggles with Snappy, but as long as you have all the driverpacks on the E2B drive, it seems to be working on both the Lenovo and my little EeePC. P.S. I discovered that the first release of the MS Windows 10 TH2 ISO has a bug in that there is no internet connectivity during the early ('Specialize') setup stage (which is currently when SDI and choco first run). The latest TH2 versions however, work OK. I used the handy ISO file Download Tool here to get the various versions. For the next version of the MPI Tool Pack, the CSM Menu.lst will now support a MyCSM.cfg file. This file uses the same basic structure as MyE2B.cfg. Only the basic menu features are supported such as menu position, colours, menu border, menu auto-number disable, heading and footer text, centred heading, GFX Boot menu or a user wallpaper file. This means you can design your CSM menu using the E2B_Editor.exe utility and save it as \MyCSM.cfg. If you place the file (and wallpaper file) in the CUSTOM folder of the MPI Tool Pack folder, then any new .imgPTN files that you make will use your new menu theme.